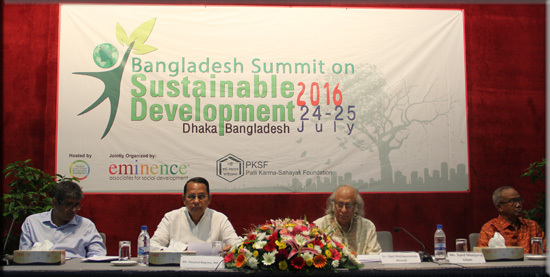 A 2-day Bangladesh Summit on Sustainable Development 2016 took place on 24th-25th July, 2016 at PKSF Auditorium. The event was jointly organized by Eminence Associates for Social Development and Palli Karma-Sahayak Foundation (PKSF) in association with Global Citizens’ Forum on Sustainable Development (GCFSD). Dr. Qazi Kholiquzzaman Ahmad, Chairman, PKSF, convener of the summit organizing committee chaired inaugural session of the Summit. Mr. Hasanul Haq Inu MP, Hon’ble Minister, Ministry of Information, Government of People’s Republic of Bangladesh, inaugurated the Summit as the Chief Guest, while Mr. Syed Monjurul Islam, Secretary, Ministry of Health and Family Welfare, was present as the Special Guest. Dr. A.K. Abdul Monem, former Bangladesh Ambassador and Permanent Representative to the UN in New York, was present as an Hon’ble Guest. A number of specialists representing different areas of development and academia took part in nine different sessions as key-note speakers and panel discussants. They were from different government and non-government organizations. Seven plenary sessions were discussed on the issues on poverty and hunger, health, nutrition and food security, education, water and sanitation, public habitation, and climate change. Noted academics, development workers, government officials, NGO professionals, journalists, students from colleges/universities attended those knowledge-sharing sessions. The Summit focused on various issues of sustainable development and the role of civil society actors, key government functionaries, development partners, academics and researchers in the process of realizing the agenda and how they can play an active role in it.